The third edition of this innovative work again provides a unique perspective on the clinical discovery process by providing input from experts within the NIH on the principles and practice of clinical research. Molecular medicine, genomics, and proteomics have opened vast opportunities for translation of basic science observations to the bedside through clinical research. As an introductory reference it gives clinical investigators in all fields an awareness of the tools required to ensure research protocols are well designed and comply with the rigorous regulatory requirements necessary to maximize the safety of research subjects. 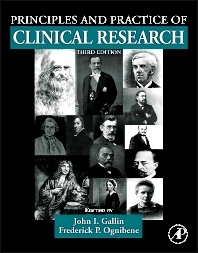 Complete with sections on the history of clinical research and ethics, copious figures and charts, and sample documents it serves as an excellent companion text for any course on clinical research and as a must-have reference for seasoned researchers. What does Ethics have to do with Clinical Research? What Makes News In Science and Medicine? What if you are Misquoted? How are Function, QOL, and HRQL Measures Used? What Happens to your Protocol?